William John Clifton Haley (/ˈheɪliː/; July 6, 1925 – February 9, 1981) was an American singer-songwriter and musician. He was one of the first to make rock and roll music popular in the 1950s with his band Bill Haley & His Comets. He sold 25 million records worldwide with hits such as "Rock Around the Clock" (1954), "Shake, Rattle and Roll" (1954) and "See You Later, Alligator" (1956). Haley was born in Highland Park, Michigan. At the age of four, he had operation on his inner-ear, which cut an optic nerve, making him blind in his left eye. He died of a heart attack caused by alcoholism on February 9, 1981 aged 55. The following recording by Bill Haley was inducted into the Grammy Hall of Fame in 1982. ↑ "Radaumusiker". seite3.ch. Retrieved April 9, 2013. ↑ Fuchs, Otto (2014). 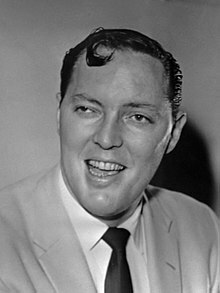 Bill Haley: The Father of Rock & Roll. Wagner. p. 16. ISBN 9783866839014. ↑ Hall, Michael (31 May 2011). "Falling Comet". Texas Monthly. Retrieved 5 February 2017. ↑ Grammy Hall of Fame Database Archived July 7, 2015, at the Wayback Machine. This page was last changed on 21 February 2019, at 05:05.